Imagine the electrical assets in your hospital fitted with sensors that can detect anomalies and less-than-perfect conditions. Imagine one of these sensors is identifying unexplained heat spikes in one of your transformers. It automatically sends an alert to your facility manager, as well as a remote team of electrical service experts, who investigate the matter further. Imagine if that team of experts discovered that your transformer was on the brink of explosion, and advised your facility manager to take it offline and replace with a new one immediately. Sounds amazing, right? That level of real-time actionable intelligence is impossible without IoT. Now imagine you heeded their warning, and replaced your transformer. You just saved your hospital $1 million or more in unexpected costs by avoiding power loss, hospital downtime, repairs due to fire and smoke damage and more, not to mention you saved your hospital from negative media coverage that could hurt its reputation and financial health. The story you just read is true, and is exactly what happened at University of Rochester Medical Center after they implemented an IoT solution to help them better manage electrical assets with predictive analytics. It is just one example of IoT leading the way toward healthier, safer hospitals. Separately, IT and OT have their own strengths. But together, they become what our Executive Vice President of Digital Services and IoT, Cyril Perducat, calls a “brain of brains.” Together, they are stronger, more intelligent, and more beneficial than they are apart. There are few sectors more “asset-intensive” than healthcare. As such, IT/OT convergence promises significant benefits to healthcare facilities. This convergence promises a more connected environment where information technology (IT) systems and operations technology (OT) systems speak to each other. The data is collected from the OT systems and transmitted to IT systems in a way that drives better decision-making and ultimately improved patient care. 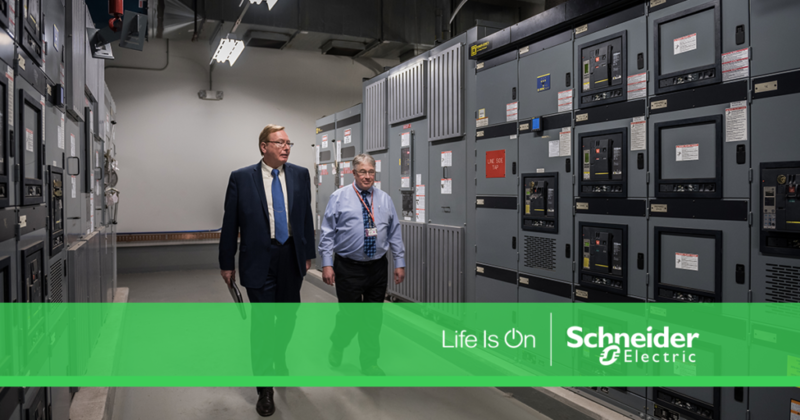 As the story of the failing transformer shows, one key area where the IT/OT convergence will drive both better decisions and cost savings is facility maintenance. There are three types of maintenance: reactive, preventive, and predictive. Reactive follows the break/fix mentality. When something breaks, your team goes into action, doing its best to manage a crisis and put all systems back in working order. Preventive maintenance includes standard, scheduled checks of facility systems. These regular checks give clues if something is faulty. The goal is to address issues early and avoid costly problems later. Predictive maintenance involves real-time monitoring of data from IoT devices, such as the before-mentioned sensors, that indicates a problem with your equipment. That information allows facility managers to action long before a failure leads to a crisis. Reactive and preventive maintenance are part of all facility management, but only the IoT which leverages IT/OT convergence empowers predictive maintenance. This convergence offers real-time information so your team can proactively perform maintenance, saving money and man-hours, as well as ensuring patient safety. As healthcare is being driven to achieve more with less, the IT/OT convergence promises time savings for your facilities management team and cost savings to please healthcare administrators. Want to learn more about how IoT and IT/OT convergence will deliver improved healthcare facility operation?